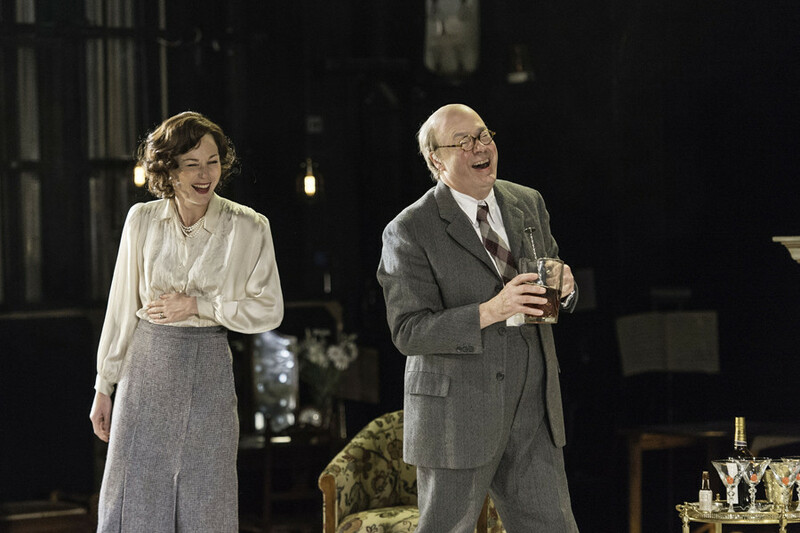 David Hare’s highly-acclaimed drama, The Moderate Soprano, won the hearts of audiences and critics during its Hampstead Theatre run in 2015. Now, it’s making the West End swoon at the Duke Of York’s Theatre. With just over four weeks left of its strictly limited run, we spoke to the show’s stars – Roger Allam (playing John Christie) and Nancy Carroll (who plays Audrey Mildmay) – to find out more about the intense love between their characters, what drew them to the roles and why it’s such an important watch in a post-Brexit world. How would you describe the Moderate Soprano to anyone who’s unfamiliar with it? Nancy: It’s a story about the beginning of the Glyndebourne Opera Festival and the three men who escaped from Nazi Germany and happened to arrive at Glyndebourne at just the right time. It’s about the marriage between Audrey Mildmay and John Christie. And it’s about this extraordinary dream that really shouldn’t have happened but did because of the serendipity of these people coming together. Roger: Because the three refugees from Germany – Fritz Busch the conductor, Carl Ebert the theatre director, and Rudolf Bing the administrator – were probably the three best people in the world if you wanted to start an opera house. So John and Audrey completely lucked out that they happened upon them. It’s also about John and Audrey. John fell head over heels in love with Audrey. He had the money and the land and she had the diplomacy and was a fantastic singer so those five people came together and got it started. And Audrey and John have a great love story as well. What did you know about Audrey and John before working on the play? Roger: Nothing at all. I mean the story of the play was a complete revelation to me which made it so interesting to do. Nancy: I think, to this day, there’s very little known about her. People tell fantastic stories about John. He was an extraordinary man. He didn’t have to work but he used his energy, eccentricity, money and, I suppose, stubbornness to start a building company. He also ran an organ company. The Christie Unit Organ which was sold to cinemas all over England was completely his idea. He just had an extraordinary brain and was a hugely entertaining, charismatic and brilliant man. But she was an extraordinary woman. The Edinburgh festival was her idea. And in the last 8 years of her life, when she was up against it medically, she stayed on arts boards and continued to work at Glyndebourne. They were two very extraordinary human beings who worshipped each other and amongst all of those strands of David’s brilliant play, there’s this tale of deep married love. Roger: I think they needed each other. If she hadn’t met John, she would have remained a singer with the Carl Rose Opera Company. And if John hadn’t met her, he would have stayed an eccentric, rich bachelor who poured all his feeling into opera. I think opera was an access to feeling for him in a way. Was that what drew you to the roles? Roger: First of all, what drew me to the role was the description at the top of the first page: “John Christie enters. He’s short, fat, bald and wearing lederhosen.” That was an instant attraction for me. The infantile aspect of dressing up which I enjoy. But then what drew me was the revelation of the story. The love between John and Audrey and these three men escaping from Nazi Germany. Nancy: For me, the thing that scares me and enthrals me is playing the same woman but in two very different times in her life. One when she’s pregnant with their second child and was really at the height of her powers and then when she was basically dying and her light was going out. And I think there were elements of it when I first read it which terrified me. In one scene, she’s completely blind and it very much scared me. In that moment you feel like you want to be in control of the image you’re presenting to the audience so to lose your sight, I didn’t know how that would feel but actually the fear of it informed the performance. It’s a challenge I now enjoy. What was it like bringing real, historical figures to life? Nancy: The Christie family has been involved from the very beginning. So there was a great responsibility to the family and the story. And it’s such an interesting time for women. There’s so much people are prepared to listen to now. That wasn’t the case even five years ago. And if women speak loudly, it’s not anger. It’s informative. Previously, if people spoke up about things they’d be slightly written off – like they were making a bit of a fuss. But now, we want to bang the drum a bit and actually, these extraordinary women have been making things happen for centuries. Audrey’s one of them. This woman who allowed herself to slip into the shadow of her husband’s glory but was actually totally, glorious in her own right. It’s wonderful to play a woman whose story is finally being told in the light of all the changes that are happening as we speak. You were both in the Hampstead Theatre production, how different is it at the Duke Of York’s? Nancy: Very different. It’s a different experience and a different access for the audience. Because of the cross arch, it suits the production more in many ways. David has re-written parts and we have three new actors. Although Ray Smith’s set was beautiful in many ways, Bob Crowley’s suits the play in its new form extremely well. It’s a beautiful revisiting. I can only speak for myself, but having the chance to do it again has only deepened my love of the play and David’s extraordinary writing. What was it like playing those characters again after so many years and what was the process to get back into them? Roger: I worked at the RSC for a long time where very often you pick up a play a year after you’ve performed it to perform it again. So I rather like the process of coming back to something because you’re familiar with it and you can get back into a groove as it were. And you can change things. I enjoy it very much. Nancy: I think with any passing of time, your skin changes, your anatomy changes – whether you like it or not – and all that time in between, you inevitably come to it with slightly different eyes which I think is a really interesting process. Even though it’s set in the ‘30s and 50’s, there are a lot of themes that are relevant today. How are they translated? Nancy: I think post-Brexit, it’s an incredibly necessary story to tell. The fact that something that’s seen to be so quintessentially English is actually totally the baby of these three extraordinary Europeans. You know, as we threaten to leave that alliance, these stories are essential. It’s incredibly relevant and incredibly interesting for a modern audience. Roger: The play is set during the lead up to the war that decimated Europe and out of it, the EU was created as a kind of modest way of stopping that kind of war in Europe again. So you know, it takes us back to the beginning of that. And whether you like opera or not, it’s irrelevant. Because art and telling each other stories, it’s what human beings are best at. We’re at our best when we work together to create something beautiful that inspires us instead of having the most intense, destructive and volatile arguments about politics or religion. Could you sum up why people should come and see the Moderate Soprano? Nancy: Because it’s a bloody good play performed by six bloody good actors. Nancy: It’s a really good story and it has so many surprises. It’s a beautiful play. To say it’s just about opera does it an injustice. Book your tickets to The Moderate Soprano, now!